you know what it's time for! Another picture from my phone. I swear I'm not going to turn into one of those people who only takes pictures with her phone and never with a real camera. But this wouldn't be my blog if I didn't document the first swim of the season, right? 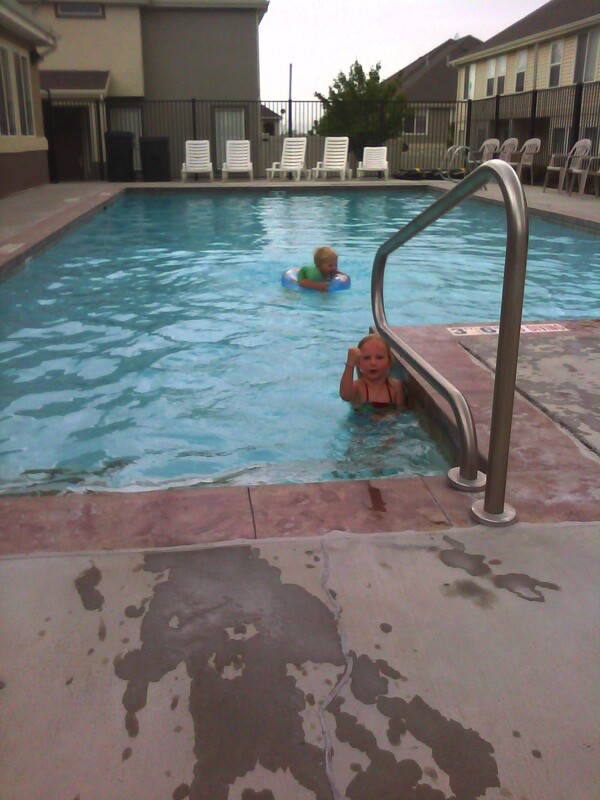 It was windy, and about to rain at any minute, but my kids are die-hards. Or at least Alexis is--and you know all about her persuasive powers. I did not get in this time. Jeremy asked me why I didn't, since I have a maternity suit, so I told him that I'm pretty sure maternity suits are not meant for 39 week belly's. The flu is making it's way through our house, and I hope it leaves for good before this new little guy arrives. I had it last weekend, Tyler had it on Wednesday, and now Jeremy's got it. It's a pretty nasty version of the flu, but it moves quickly, so hopefully Jeremy will be better soon. Did you know that Wednesday is the day? Well really, it could be any day now. I went to the doctor and I'm dilated to a 3, which has never in my life happened before. With my previous two kids I never got past a 1 until they hooked me up to the Pitocin. So there's hope for me yet. But even if nothing happens until Wednesday, I'm still pretty proud of myself! Yesterday Alexis "graduated" from kindergarten. I'm generally not of the mindset that it's necessary to throw graduation ceremonies and parties for things like preschool and kindergarten, but I have to admit it was pretty cute to see her up there with her class, and receiving her "diploma". I can't believe it was 9 months ago that she started kindergarten, and even though I'm afraid it's going to be a long summer, I'm really not ready to part with her all day long, starting in the fall. Kids really do grow up too fast. Have I mentioned that I'm a little afraid of change? And there's a lot of it coming at me fast. I wonder if I can get it stop by throwing a big fit. Although I suppose life would just be easier if I learned to roll with it instead. I love these kids. I really, really do. 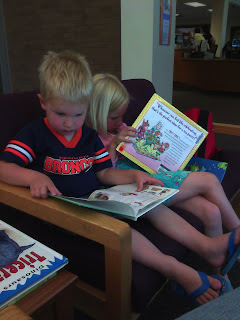 I took this picture today at the library because it reminded me of how they really are with each other. He's looking at a book about dinosaurs (of course) and she's looking at a Fancy Nancy book (of course), and they are smashed on that little couch together, neither one complaining. Occasionally Tyler will say, "Alexis, look a T-Rex!" and she'll hurry and look. Or she'll point out something funny in her book and he'll laugh along with her. It was all very sweet and cute and a good reminder to me of what good, loving kids they really are. Because lately they've been crazy. And that is an understatement. Two weeks from today I'll be induced (I've given up hope that the baby will come on his own), and I think the kids sense the change coming. Obviously they know about the baby, but they don't know what it will do to their world. But they sense it. And on top of that we've had another recent change that has altered our world. I've tried to make the change an easy transition for them. I've tried to make it something they don't even notice, but they seem to be able to feel it. And the combination of these two things have made them C.R.A.Z.Y! It was about this time in my pregnancy with Tyler that I started to panic for Alexis. I realized that her world was about to be rocked and I felt pretty bad about it. I worried that she would be lonely and feel abandoned. This time around, I don't feel those things. And I think it's because of the closeness that is evident in the picture above. They'll always have Jeremy and I, but if in the next few weeks they don't feel like they do, hopefully they'll feel like they have each other. That is if they haven't killed each other before then. It's been almost two weeks since I last blogged, I think that's a record for me. Besides the pregnancy we've got other things going on here that are a bit distracting. That would be my excuse, but mostly it's the pregnancy. I believe my stomach has reached maximum capacity, so I'm hoping it'll stop stretching. And the bigger my stomach gets, the dumber my brain gets. Go ahead and bring up something intelligent around me, it'll be good for a laugh. Which leads me to wonder why I continue to watch Jeopardy nightly? I'm down to 3 1/2 weeks or less! I've been experiencing pre-labor things that I never experienced with my first two, so I'm holding out hope that my body may actually go into labor on it's own this time. Jeremy finds that funny, so at least I've given him a reason to tease me. I thought I'd share a few recent proud parenting moments, just for fun. I've noticed lately that Alexis' manipulation tactics have expanded and she now uses prayer as a form of it. When given the opportunity to say our nightly family prayer, she'll often pray that Tyler stops doing whatever behavior she finds bad or undesirable. Occasionally if she's plenty upset with me she'll pray for me also, but it most often is directed at Tyler. Tonight while we were up in the kids room putting them to bed, Jeremy pulled out his phone and opened up some "fart noise" app that he has on it. Tyler wanted a turn making a noise on the phone so Jeremy told him to go fart then. Tyler went over and sat on a chair, looked at us for about ten seconds, and then sure enough, farted on command. I'm pretty sure Jeremy will use that story someday when bragging about his kids. I just find it amazing. Here's a cute picture of the kids taken the first night we moved them into the other bedroom, with their new bedding. And lastly, here's a video that shows a fairly daily occurrence around here. I used to wrestle with my kids before I started growing another one in my stomach, and I think Tyler has really missed it. Now he knows that his only source of wrestling is Jeremy, so the minute Jeremy walks in the door from work something triggers in Tyler and he becomes insane. The other night he was especially wild so Jeremy grabbed the camera and took a few short videos of it. The best part is that Alexis recognized the craziness and went and put on what she called her "protecting gear". You'll notice a beanie and a helmet, socks on her hands, a backpack on her chest, and snow boots. Unfortunately, even with all her protective gear, she still doesn't stand a chance against Tyler. I know that while watching that you were primarily concerned with the safety of our furniture, our TV, all our nice things. But don't worry, we're having a boxing ring installed next week.